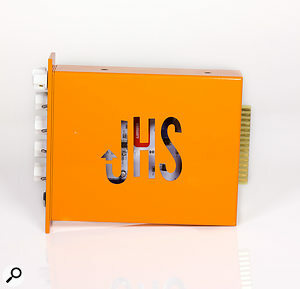 Based in Kansas City, JHS Pedals are named after their founder Josh Heath Scott, and they’re a classic case of a hobby that turned into a business — a business that, in this case, then grew from a one-person, micro-scale, guitar pedal ‘mod shop’ into a thriving pedal company with a world-wide reach! As well as designing the effects, Scott has come up with a neat line in product names. The Pulp ‘N’ Peel name applied to this new 500-series module was first used on a stompbox, which is currently in its fourth generation. 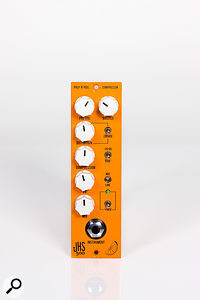 But while the new module (one of several in a new range) does draw on this heritage, it also offers rather more: there’s a mic/line preamp, an instrument input, a distortion/overdrive processor, a compressor, and a tilt EQ — an impressive amount of processing and control to cram into a singe-width module. The Pulp ‘N’ Peel’s circuitry sits inside a chunky, orange-painted, all-steel chassis. Component quality and construction are exemplary, with a THAT 1512 audio preamplifier at the input and a THAT 1646 balanced line driver at the output. 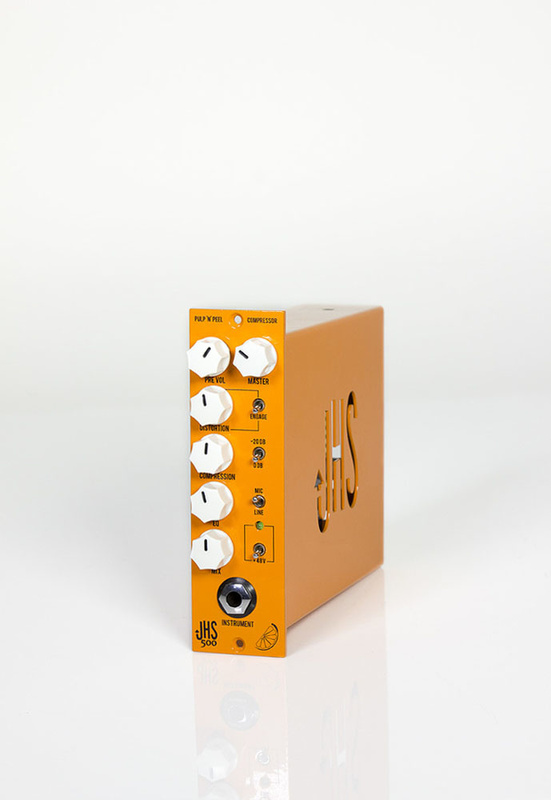 The module’s preamplifier section carries switchable 48V phantom power, a Mic/Line switch and a selectable -20dB pad. A Pre Vol control sets the level of the preamplifier’s output. 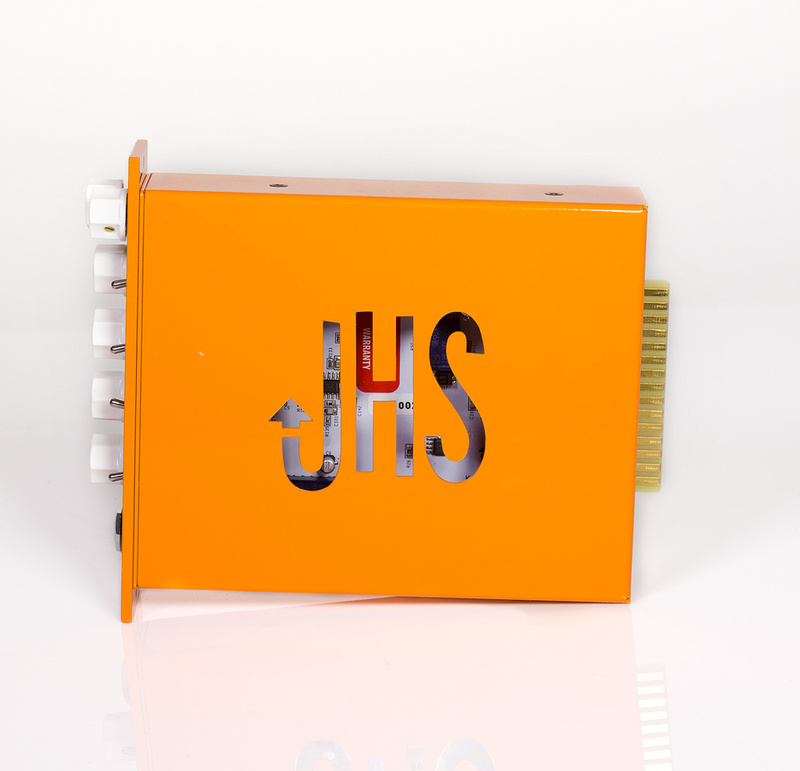 A front-panel instrument-level jack, which bypasses the Pulp ‘N’ Peel’s preamplifier, allows you to plug in a guitar, bass or other instrument. The Engage switch activates the distortion/overdrive circuit, which is controlled by the Distortion pot. 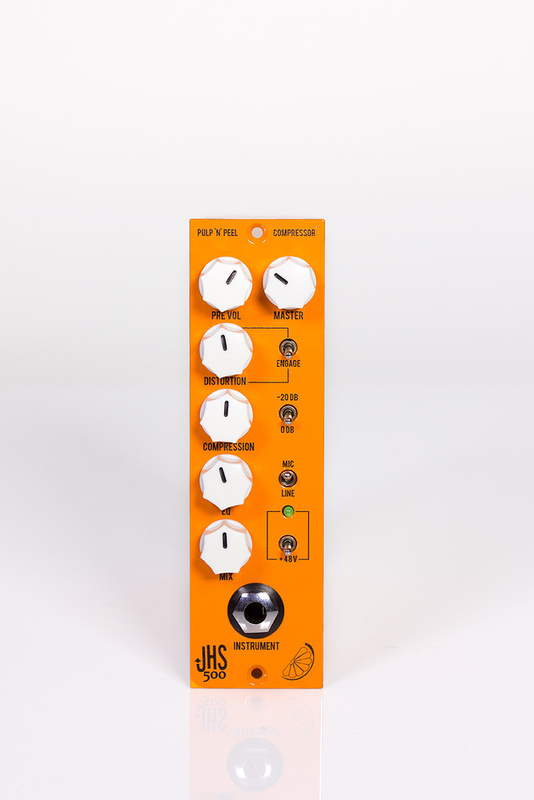 A single-knob compressor comes next, followed by a ‘tilt’ tone control, which is flat at the 12 o’clock position but boosts bass and cuts treble when turned anticlockwise and does the opposite when turned clockwise. Like the Pulp ‘N’ Peel v4 pedal, the 500-series variant is set up for parallel processing, with a Mix control setting the ratio of clean to effected signal in the module’s output, from fully clean at zero to fully wet at maximum. Finally, a Master level control allows you to match the output of the Pulp ‘N’ Peel to the next stage in your signal chain. With the Mix control set to fully dry, the 500-series Pulp ‘N’ Peel is a clean, clear and detailed microphone preamplifier, which works well with both condenser and dynamic microphones for vocals and acoustic instruments. Plugging electric or electroacoustic guitars and basses directly into the front panel input also gave good clean results that would be ideal for reamping or further processing inside a DAW. The distortion section responds well to guitar pick and finger dynamics, moving from clean, through grit, into crunch territory and reaching overdrive as the Distortion control is turned clockwise. The facility to mix distorted and dry signals makes the Pulp ‘N’ Peel 500 ideal for subtly (or not, if that’s your thing) adding a bit of gritty character not only to guitars but also to vocals. The compressor is set up to give a natural-sounding compression that brings the signal level under progressive levels of control without creating any pumping effects. Again, mixing the resulting compression in with the dry signal gives you the opportunity to add controlled weight to your sound without losing its dynamic character. Although there’s no control over the pivot frequency, the tilt EQ is effective, without becoming too extreme at either end of its range. Like the other processors, this is also affected by the Mix control so I found the EQ more useful as a bass or treble enhancement when necessary — in other words, for broad tonal control rather than as a primary vocal or instrumental EQ. The 500-series version of the Pulp ‘N’ Peel should appeal not only to guitarists and bassists (who might also want to try the lower-priced pedal of the same name), but also to vocalists, synthesists and keyboard players who are looking to add some grit or polish to their sounds. Studio engineers might also find the Pulp ‘N’ Peel useful for both track and bus processing, since the Mix control makes it possible to apply processing with great subtlety, even when the module’s effects are maxed out. The Pulp ‘N’ Peel isn’t quite like anything else I’ve seen in the 500-series format and it’s a module that really should be auditioned if you get the chance. For me, at least, the sonic potential it offers certainly justifies its asking price. Packs a lot into a single-width module! Distortion section responds well to guitar pick and finger dynamics. Wet/dry mix control allows subtle application on various sources. 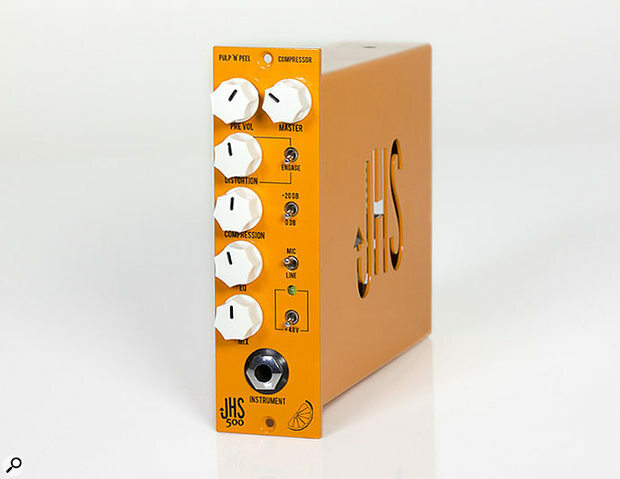 This interesting module draws on JHS Pedals’ colourful stompbox circuitry to create a versatile processor for a range of sources — not only bass and guitar.